“The Zookeeper’s Wife” (2017). Cast: Jessica Chastain, Johan Heldenbergh, Daniel Brühl, Timothy Radford, Val Maloku, Efrat Dor, Iddo Goldberg, Shira Haas, Michael McElhatton. Director: Niki Caro. Screenplay: Angela Workman, Book: Diane Ackerman, The Zookeeper’s Wife. Web site. Trailer. In Warsaw, Poland in 1939, Antonina Zabinski (Jessica Chastain) and her husband, Jan (Johan Heldenbergh), run the city’s zoological garden, a beautiful and popular attraction among the locals. The Zabinskis warmly welcome visitors and lovingly care for their animals, especially Antonina, who dotes on the creatures as if they were her own children. They also readily share their experiences with visiting dignitaries, such as Lutz Heck (Daniel Brühl), chief zoologist at the Berlin zoo. But then comes September 1, 1939, the start of German Chancellor Adolph Hitler’s blitzkrieg, the Nazis’ brutal, lightning-fast assault on Poland that quickly leads to the country being overrun, the event that marks the start of World War II. In the midst of the melee, the zoo is virtually bombed out of existence, with many of its facilities destroyed and many of its animals killed or let loose into the streets of Warsaw. Somehow, Antonina, Jan and their son, Ryszard (Timothy Radford), manage to survive relatively unscathed. But the facility the Zabinskis have spent their lives developing is left in a shambles. And, to add insult to injury, German forces take over what’s left of the zoo to use it for a staging area under the direction of their commanding officer, Lutz Heck, now a high-ranking Nazi official. Given the relationship Antonina and Jan have cultivated with Heck, as a fellow zookeeper, the German commander is surprisingly accommodating to their circumstances. For example, he agrees to spare the zoo’s best specimens by moving them to his facility in Berlin. But, at heart, Heck is still part of the invading German force and places his country’s interests first, including those of a zoological nature. As the occupation of Warsaw proceeds, the Nazis’ plan to round up the city’s Jewish population begins. They are confined in the Warsaw ghetto and largely refused access to other parts of the city. Antonina and Jan, who have a number of Jewish friends, such as Magda (Efrat Dor) and Maurycy (Iddo Goldberg), are quietly appalled by the development and wonder if there is anything they can do to help. It soon dawns on them that they have an extensive basement complex underneath their home, one that connects to the zoo’s facilities via a series of tunnels – an ideal place to hide the persecuted. 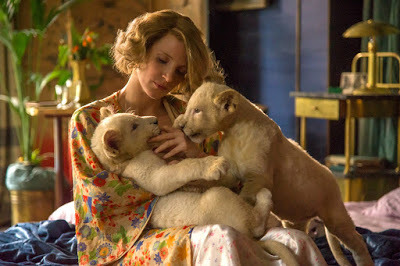 Antonina Zabinski (Jessica Chastain), co-owner of the Warsaw zoo, loves animals almost as much as she loves people, a trait amply illustrated in the new, fact-based historical drama, “The Zookeeper’s Wife.” Photo by Ann Marie Fox, courtesy of Focus Features. Antonina and Jan concoct a ruse to convert the zoo into a pig farm, a source of readily available foodstuffs for hungry German soldiers. They propose that the swine be fed with food scraps collected from trash heaps in the ghetto, material that can be loaded into the large storage compartment of their truck, one that’s handily big enough to transport concealed refugees out of their confinement and into the safety of the zookeepers’ basement. Believing that Heck sees them as friends, they pitch the proposal to him, and he readily agrees. It’s a decision that effectively green-lights the Zabinskis’ plan, one that would inevitably save the lives of hundreds of Jews who would have otherwise met an unspeakable end in Nazi concentration camps. Ideally, no one – neither protector nor victim – should have to contend with the kinds of circumstances that the citizens of Warsaw went through during World War II. But, when confronted with such conditions, our resourcefulness for survival gets put to the test. And it’s at times like that when our conscious creation skills invariably prove more useful than ever. As the process behind which we employ our thoughts, beliefs and intents to create the reality we experience, our aptitude for it may very well mean the difference between life and death. Extraordinary challenges call for extraordinary responses, and that’s what heroic figures like the Zabinskis put to use to help save the lives of hundreds.  Accomplishing this requires us to push the limits of what we’re able to envision, to come up with solutions that go beyond traditional tried-and-true measures, and to develop and employ beliefs that make such scenarios possible. And, considering the plan that Antonina and Jan devised, they certainly succeeded on those points. Given the tremendous pressures placed on the Polish people by the invading Germans, including those who weren’t part of the local Jewish population, one might wonder what would prompt someone to stick out his or her neck and risk the potentially severe retribution that would inevitably come from an activity as perilous as intentionally hiding enemies of the state. Some might see this as an almost suicidal path. But, given the Zabinskis’ character, their actions were right in line with their nature. When one witnesses the kind of loving compassion they show toward their zoo’s animals, as seen early on in Antonina’s handling of a mother elephant in distress over her baby’s failing health, it’s no wonder that the couple would do the same when it came to aiding their fellow human beings. 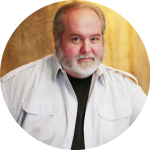 Their conduct was a direct reflection of their beliefs brought to life, a force so strong that it was virtually unstoppable, no matter what the odds. This heroic behavior clearly illustrates one of conscious creation’s key concepts, that of conquering our fears and living courageously to bring our most heartfelt manifestations into being. Their example is especially inspiring in light of the conditions under which they operated. If they can accomplish what they did under those circumstances, anything short of that should be easy by comparison. Antonina Zabinski (Jessica Chastain, right) and her husband, Jan (Johan Heldenbergh, left), co-owners of the Warsaw zoo, devise an inspired plan to help protect members of the city’s Jewish population at the start of World War II in director Niki Caro’s latest offering, “The Zookeeper’s Wife.” Photo by Ann Marie Fox, courtesy of Focus Features. 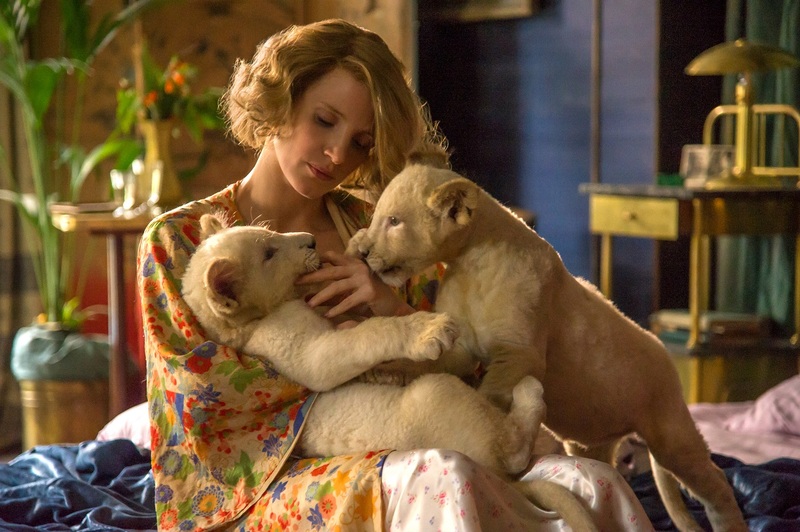 “The Zookeeper’s Wife” clearly demonstrates what it means to be selfless and heroic. Through their efforts, the Zabinskis managed to spare the lives of many of Warsaw’s persecuted. And they did so under considerable duress, with their own safety – and even the sanctity of their marriage – often at risk. But, when it came to doing the right thing, they never hesitated to stick to their convictions and follow through on their plans. Director Niki Caro’s inspiring tale of a courage is reminiscent of “Schindler’s List” (1993) but in a uniquely different setting. The film features an excellent lead performance by Chastain, gorgeous cinematography and a moving, heroic narrative. It’s the kind of movie that truly compels us to take a stand when one needs to be taken. However, given the film’s subject matter, it unfortunately also feels a bit “sanitized” at times, with some of the action looking as though it’s taking place on a movie set and not in the kind of real-world conditions that existed at the time. In all likelihood this was done to make the movie more appealing to a wider, more commercial audience, but this approach sometimes rings a little hollow in light of the story. While a gratuitous take undoubtedly would have been inappropriate, the film nevertheless probably would have benefitted from a somewhat grittier edge to make it feel a little more authentic. Hard choices are difficult to face and even more challenging to address. But, when we consider what’s at stake, sometimes we may feel as though we have no choice but to act. That’s what it means to be a hero, and the Zabinskis truly epitomize that ideal. May we all draw from their inspiration when we come up against challenges of our own.